Chocolate mousse is my favorite easy keto dessert! It takes less than five minutes to make with only a few ingredients. Treat yourself to small bowl of chocolate mousse and share it with someone special. Try all my keto mousse recipes: Peanut Butter, Strawberry, & Coconut Mousse. If you enjoy this keto recipe, please share it on social media with your friends and family. It helps me out a lot! Chocolate mousse or mousse au chocolat originates in French cuisine. The French word "mousse" translates to "froth" or "foam." This elegant dessert became popular in the United States in the 1930's along with chocolate pudding. French mousse was originally made with sweet fruits, savory meats, or veggies. It is typically served in fine glasses or small bowls and garnished with nuts, fruits, and sauces. Make my easy keto chocolate mousse, then experiment with other flavors to create your own unique recipes. Leave me a comment to share what you create! Enjoy my easy keto chocolate mousse recipe for dessert. It’s the perfect treat to share with a romantic partner. View more of my keto mousse recipes: Peanut Butter, Strawberry, & Coconut Mousse. You can learn more about these products and visit my Keto Shopping List for more diet approved ingredients. Click through my links, then purchase anything from Amazon to help support my blog. Mix all the ingredients in a bowl with an immersion blender. Use a deep bowl to prevent splatter. 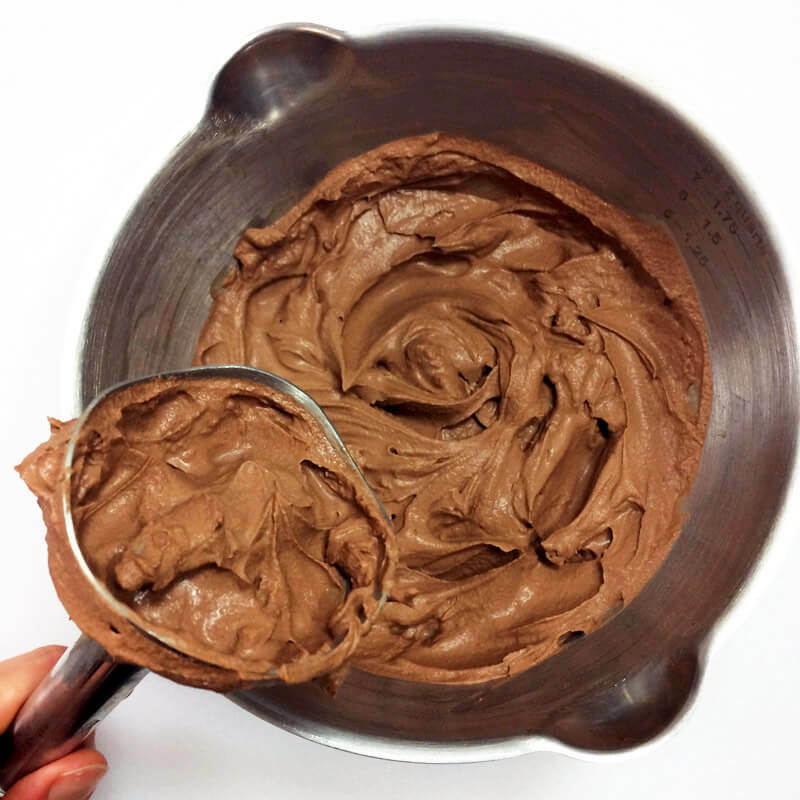 Mix for about 1 minute until the chocolate mousse is thick and fluffy. Scoop it into small bowls and garnish with the optional ingredients. Add a few berries on top for a great flavor combination! Mixing adds air for fluffy texture. Use a food processor or Nutribullet instead of an immersion blender. 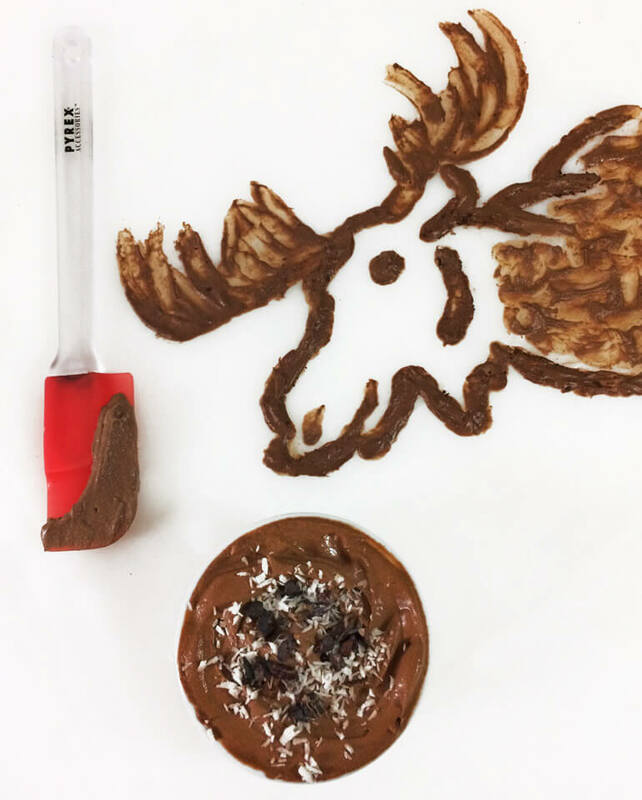 You can also whip the chocolate mousse with a whisk, but it's a workout! Enjoy low carb berries on the keto diet. Blueberries, raspberries, and strawberries only have 3-4 net carbs per 1/4 cup. View my Strawberry Mousse for a great example. A small bowl of chocolate mousse can satiate your hunger. Magnesium combined with fat will help you sleep better. Eat a nutrient dense dinner for successful Time Restricted Eating. Always plan and eat meals in a consistent and predictable structure. Keep scrolling to learn more about how to use this recipe for weight loss. My easy chocolate mousse is very rich and satisfying. I never eat more than 1/4 cup, because it is such a filling dessert. If you have a light dinner, a small bowl of chocolate mousse will help you feel full until the next day. Continue reading for more information about weight loss on the keto diet. Losing weight by eating chocolate mousse? You have to be joking! Well, I’m not kidding around. I want to give you some common sense advice about how to use this recipe for weight loss on the keto diet. My keto chocolate mousse has only 210 calories per serving, so it’s not a diet breaker. This dessert is low calorie with no sugar, and it's totally rich and satisfying. You won’t feel like overeating this one. If you like strawberries, you should check out my Keto Strawberry Mousse with only 165 calories and 1 net carb. Imagine this scenario: after a busy day, you eat a light dinner and are still feeling a little hungry. You ask yourself, should I eat something else or should I abstain until tomorrow? Eating a small bowl of chocolate mousse will satiate your hunger and set you up for successful Time Restricted Eating the next day. The little extra fat and magnesium in the chocolate will help you sleep better too. It's best to east in a consistent structure that fits your unique lifestyle. For example, I eat breakfast at 11:00 AM, an optional snack at 2:00 PM and a large dinner at 7:00 PM. When you choose eat with structure, your metabolism will become accustomed to a consistent pattern. The body is much happier when it can rely on a predictable pattern of eating. Alternatively, there is mindlessly eat without structure. The body is not able to predict food consumption and the metabolism becomes off balance. If you would like to learn more about weight loss, visit my Keto for Weight Loss. Buying bulk foods online can save you money and time. You also help support my blog when you click through my links and purchase anything from Amazon. I only choose the best keto ingredients for your diet. Cocoa powder is a great ingredient for the keto diet. For every tablespoon, there are 10 calories, .5g fat, 1 net carb, 2g fiber, and .5g protein. Cocoa is high in magnesium, which is an essential mineral involved in many biochemical processes. Most Americans are deficient in magnesium, and supplementing with magnesium citrate before bed can promote restful sleep. You could also just eat a couple tablespoons of cocoa nibs, which are super dense in magnesium! Liquid stevia is my go to sweetener for the keto diet. I like the Better Stevia brand for their large size and variety of flavors. A large bottle will last me 4-5 months, and I use it everyday! Liquid stevia is a super strong sweetener. If you are new to using it, start with only a few drops and taste test. Be sure to check out Better Stevia's different flavors like: vanilla, toffee, coconut, chocolate, and more. An immersion blender is a great cooking tool for quick keto recipes. It’s all the benefits of a blender without the awkward cleanup. You can use an immersion blender for all kinds of recipes. Check out my Keto Broccoli Cheddar Soup or my Homemade Keto Mayo for a couple examples. You could also use a Nutribullet or food processor to make my keto chocolate mousse. Redmond Real Salt is my go to mineral salt. This brand has the most minerals and best flavor. It is harvested from salt mines in Utah, which come from ancient oceans. You don’t have to worry about any toxins or plastics, which are found in the oceans today. If you would like to eat more mineral salts, I often use Himalayan pink salt, Celtic Sea Salt, and regular iodized salt for the iodine. View my favorite keto mousse recipe! Make Peanut Butter Mousse for dessert. Try my strawberry mousse for a low calorie dessert. Also, view Coconut Lime Mousse.